The New York Mets have been looking for a long-term option at first base since the Carlos Delgado era ended nearly a decade ago. Since then, the Mets have employed the likes of Ike Davis, Lucas Duda, James Loney plus a few others with only Duda having strung together much success. Even while Duda had a few strong power seasons with the Amazins, Sandy Alderson and his staff considered him a stopgap option the last few years. Over the past 6 seasons, Mets 1B have hit .242/.329/.438, which is in the bottom third of baseball over that time frame. The Mets have struggled offensively the last few years and health has a lot to do with that but strong lineups often have a big slugger at first base. The Mets haven’t had a consistent All-Star caliber hitter at first since Delgado. This year should be more of the same, so let’s examine who the Mets can look towards at this key position. Adrian Gonzalez – Gonzalez has not had a good spring after having a dismal 2017 season, where he hit just 3 home runs in 71 games. With that said it seems pretty clear that he is the Mets choice to start the season as the 1st baseman. He still carries a quality glove and has a tremendous track record of All-Star production before 2017. He’s only costing the Mets the league minimum so it wasn’t a huge risk to bring the 5-time All-Star to camp. The main risk with Gonzalez comes from his influence in the clubhouse. I say that because he intentionally missed the World Series with the Dodgers to go on vacation with his family in Europe. The Dodgers couldn’t have been thrilled with that who then convinced him to waive his no trade clause a few months ago to go to Atlanta where he would be cut. If Adrian hits this season he will remain the Mets first baseman. Dominic Smith – The Mets 2013 first round pick seemingly has squandered his opportunity to be an everyday player in New York for the foreseeable future. Dom pretty much needs to get healthy and for Gonzalez to struggle to get another opportunity. He had just a .658 OPS in 183 PA’s last season with the big club. Smith also really struggled defensively and has missed most of Spring Training with a quad injury. The perception was Dominic Smith had a shot at the Opening Day roster with a strong camp. He was benched early on in camp for being late one day, scouts have questioned his conditioning and he hasn’t been comfortable enough to run with the quad, let alone get back in a game. Dominic Smith’s Met career is in jeopardy just when it was getting started. Peter Alonso – For the last few years, there has been a pretty even split in the Mets front office on who is the first baseman of the future, Dominic Smith or Peter Alonso. Alonso, 23, has hit in every minor league stop he has been in and is probably the most likely candidate on this list now to be the Mets long-term first baseman. Alonso’s signature trait, his power, could be a game changer in New York. The University of Florida product hit 18 homers in just 93 games in the minors last season. Alonso is a big kid who has a big strike zone so K’s could be an issue as he moves up. He might not be in the Mets plans for a majority of this season (he only has played in 11 games above High-A) but this is a bat to keep an eye on. Dominic Smith needs to get on a field and produce quickly as Alonso is right on his heels now. Adam Lind – Lind, 34, has played with four different clubs (TOR, MIL, SEA, WSH) over the last four seasons. You would think with his production in that span (.280/.345/.466 in 1,621 PA’s) he would stop bouncing around but the 12-year vet was forced to sign a minor league deal with the Yankees in a very slow free agency. After it looked like he wouldn’t make the team with the addition of Neil Walker, Lind was granted his release. Lind has always mashed right-handed pitching to the tune of .288/.348/.504. He wouldn’t cost much more than the league minimum and pairing him with the lefty mashing Wilmer Flores (.862 OPS against LHP in 2017), could give the Mets one of the best platoon situations in all of baseball. Kennys Vargas – The former Twin who has drawn David Ortiz comparisons by many was designated for assignment last week by Minnesota. They have a few more days to find a trade for him before he can become a free agent. The 27-year old has shown flashes of massive power but was never able to stick as a full time 1B or DH in Minnesota. The addition of Logan Morrison, who slugged 38 homers in Tampa last season, made Vargas expendable in Minnesota. Vargas hit 21 homers over the last two seasons, in just 441 PA’s. His strikeouts are probably a huge concern for interested teams but Vargas could be worth a flier. He also has just two full seasons of MLB service, so should he be able to stick on a roster, he will be cheap and under control for a long time. It seems as if the Mets are committed to giving Adrian Gonzalez the first crack to solve this position. My choice would be a Lind/Flores tag team at first. They would be smart to check in on Lind as soon as possible and Lind would likely be interested in coming to Queens with the amount of playing time likely available. Who do you think should be the Mets first baseman in 2018 and beyond? The Mets continue to labor to simply score more than a run or two a night. David Wright is still out indefinitely and payroll restraints will prevent this club from adding a significant player at the MLB trade deadline next month. Their best option may actually be their only option as Michael Conforto has been raking in Binghamton (AA) and could be ready to make his MLB debut soon. 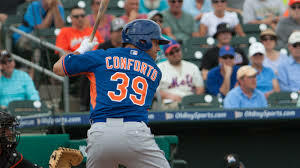 Conforto, 22, is hitting .377 with a .482 OBP in 19 games since being called up from St. Lucie (A+). He has hit 9 homers and drove in 40 in 253 at bats across two levels of the minors this season. It makes too much sense. The Mets can platoon Michael Cuddyer and Curtis Granderson in one corner with Cuddyer playing against lefties and Granderson against right handers. Both are older players that could probably use more days off. Conforto could infuse a power bat into a lineup that has scored just six runs in their last four games, all losses. Between Cuddyer and Granderson whoever produces more will stay in the lineup. The former Oregon State standout has only played in 19 games in Double (AA) but he is the most advanced hitter to come through the Mets system in at least five years in terms of how fast he is approaching the big leagues. If he struggles they can simply send him back down. 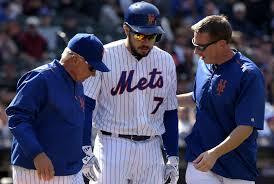 The Mets are headed down a very dark path as they continue to lose very winnable games. Their defense is horrendous, they don’t hit and the bullpen has lost most of its depth. If things continue Terry Collins is going to undeservingly lose his job. The team must do something to shake things up and if they are unwilling to pay the price to get better in terms of taking on salary or trading away prospects then they should give Conforto a shot. Before the season we talked about how Travis d’Arnaud needed a hot start more than any other Met and he has done just that. The 26-year old d’Arnaud is hitting .317 with 2 homers and a team leading 10 RBIs. The catcher also started 11 of the Mets 13 games so far. Perhaps just as importantly, d’Arnaud’s defense has improved as well. In the Marlins series he threw out Dee Gordon twice. Teams would try to run consistently in 2014 when Travis was behind the plate. The catcher has also done a nice job of pitch framing as well. With all the talk in spring of how great top prospect Kevin Plawecki looks, it was easy to connect the dots. If Travis didn’t play well than they had a suitable replacement for the backstop. Plawecki had a 5 RBI game for the 51’s in Triple-A on Saturday but for the most part has gotten off to a slow start. Plawecki was hitting just .216 in 37 at-bats in Vegas. Travis d’Arnaud is a big reason why the Mets are in first place two weeks into the year but now because one reliever couldn’t find the strike zone, he is gone indefinitely. The David Wright injury was a huge blow but this one is far worse as d’Arnaud although still early, was having a breakout year and will be out at least a few months. Kevin Plawecki, who was not playing well in Triple-A will come up and get the first crack at being the Mets #1 catcher while d’Arnaud is down. Plawecki will be the second player drafted by Sandy Alderson to make his debut with the Mets. The first was Danny Muno last week. Although the Mets are on an eight game winning streak and seemingly buried the Miami Marlins in the process it was a very somber mood around the clubhouse following the win. While the team has played well on their way to tying a franchise record best 10-3 start, the injuries have piled up and it may be too much to overcome at this point. After already losing Zack Wheeler and Josh Edgin for the season the team then lost David Wright for at least three weeks and now a catcher who could have made his first all-star game this year. The Mets a half inning earlier also lost key reliever Jerry Blevins to a fractured forearm after he was struck in his pitching arm by a comebacker. Blevins didn’t think it was a big deal before he got the diagnosis as he wanted to stay in the game. Blevins had not allowed a baserunner from the 15 batters he faced in 2015. He was the Mets best reliever through the club’s first 13 games but now they will have to hope Alex Torres can throw enough strikes to get lefties out. Now it is next man up and if this magical start is to continue than it is going to have to be thanks to unknown players like Kevin Plawecki. The Mets had a similar situation in 2006 when key pitchers like Orlando Hernandez and Pedro Martinez went down and young guys like John Maine stepped up big and helped will the Mets to the best record in the National League and their last playoff berth. Maybe a similar story will ensue but we will now know how much depth the Mets truly have. Can the Mets hold on and continue to play well? After an impressive spring training, Matt Reynolds established himself as a prospect to watch this season. He raked in the upper minors in 2014 and has very little still to prove down there. That being said the Mets continue to let the Wilmer Flores experiment play out. Flores hasn’t established a reason for the Mets to continue letting him play everyday. He hasn’t hit at all, he hasn’t shown he can hit for power even in the minor leagues, nor has he shown a great ability to get on base. His baserunning hasn’t been good and that is before we even get to his defense which has been horrendous through the first couple series. Flores has looked shaky in every game after Opening Day. Maybe he can be a right-handed bat off the bench but he hasn’t shown he can be an everyday shortstop. In a season the Mets hope to be a playoff team, they cannot afford to experiment here. If the team insists on finding out if Flores can play short they should have put him there in the minor leagues over the past few years. Flores is out of options so they cannot send him down without the risk of losing him now. Matt Reynolds has played well in Triple-A and has shown to be at least adequate at both second base and shortstop. He may not have a ton of power but he should be able to hit for a high average and most importantly he can play the position he is asked to play. 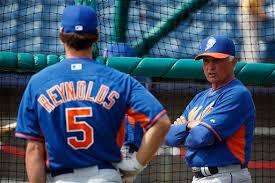 When the Mets do eventually call up Reynolds he will be the first Sandy Alderson draft pick as Mets GM to make it to New York. If the Mets want to contend this season they must plug up as many weaknesses as they can. Games in April count just as much as they do in September. Do you agree that the Mets have been too patient with Flores at shortstop?